For those who are big on symbolism this Chinese New Year, what better way celebrate the Year of the Earth Pig than with a glorious platter of suckling pig? This year, more diners are ordering the festive roast from restaurants for prayer ceremonies and gatherings. 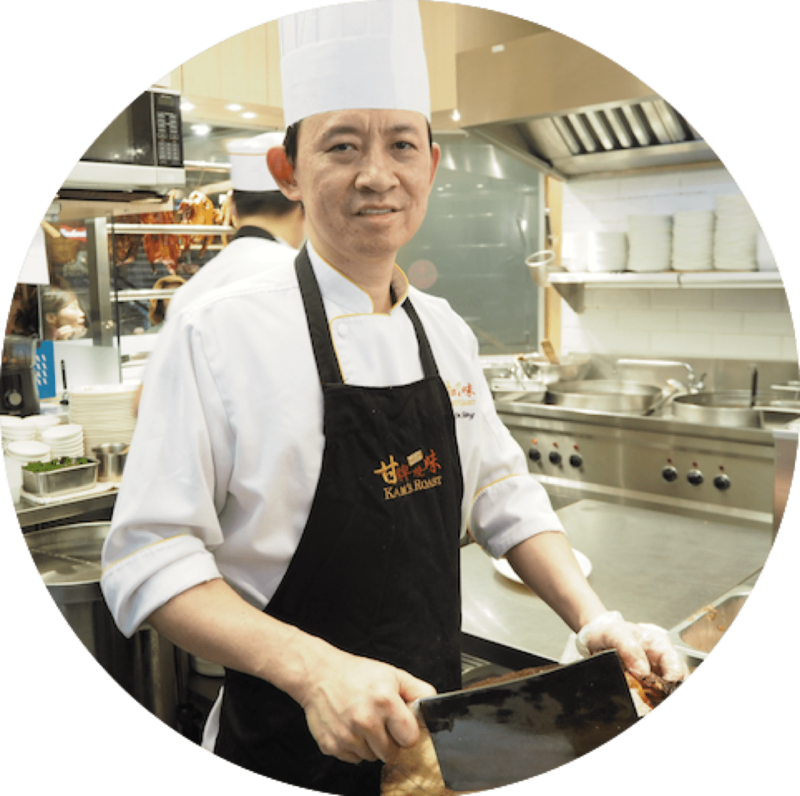 Over at Kam’s Roast, the Singapore outpost of one-Michelin-starred Kam’s Roast Goose in Hong Kong, orders have more than doubled in this year’s lead-up to Chinese New Year. About 30 pigs have been ordered and more orders are expected to stream in. The restaurant in Pacific Plaza usually sells two pigs daily. rubs each the cross section of each piglet with five spice powder before seasoning it with a “secret” marinade that comprises more than 10 ingredients including hoisin sauce, sesame seed paste and fermented soya bean paste. Then, the pig is par-roasted for about 30 minutes in an electric “Apollo” oven before it is cooled for three hours. Lastly, it is spit-roasted over charcoal for 15 minutes to achieve an intensely crispy and lacquered crackling with a smoky finish. 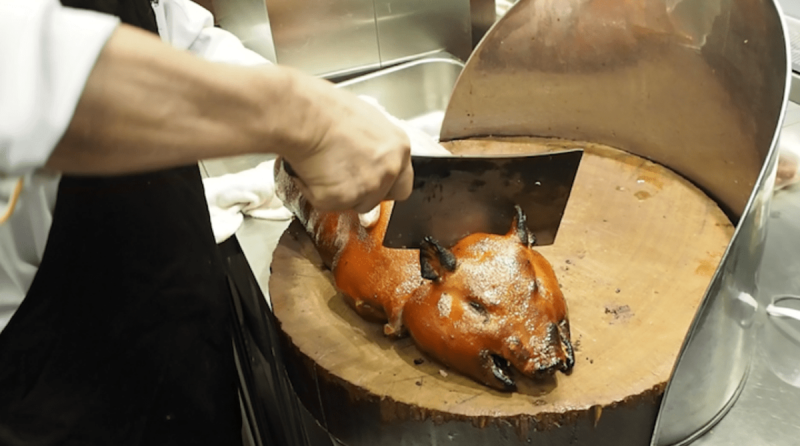 When it comes to carving suckling pigs at home, Wong says that the most difficult part lies in getting a chopping board that is big enough to fit a whole pig and a sharp chopper. 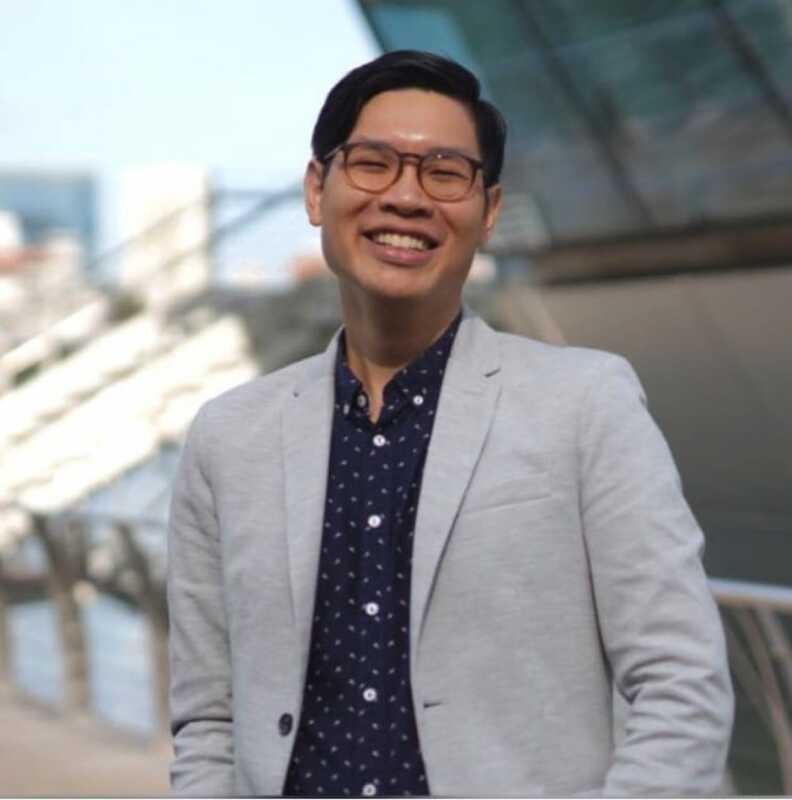 While demonstrating how to chop a pig for the MICHELIN Guide Digital, Wong had to use his palm to pound the chopper a few times to ensure that the meat is cut cleanly. 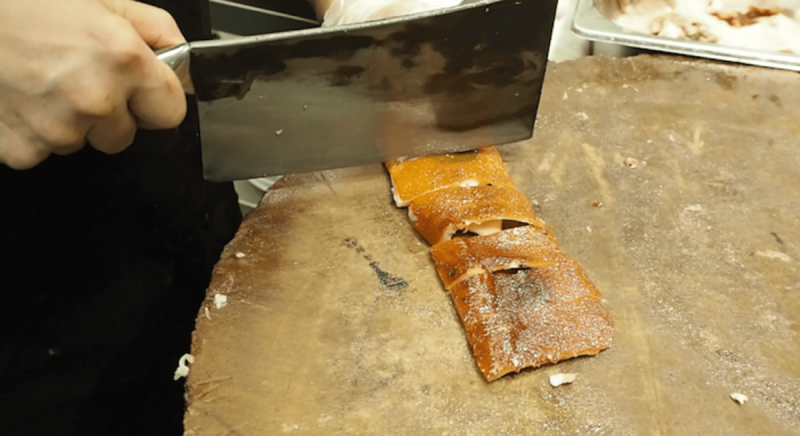 If that proves too challenging, use a pair of scissors to cut open the various parts of the pig and rectangular slices of the golden brown crackling. Parts such as the pig’s ribs, head and hind legs can be chopped up and boiled with porridge or stir-fried with spring onions and scallions. Hold down the back of the pig’s head before chopping it. For chopping novices, you will need to pound on the chopper with your other hand after making the last few chops to ensure that the head is wholly chopped off. Put the head aside. Turn over the suckling pig so that its underside faces upwards. Chop along the line of the spine that runs down the centre of the pig. Chop half of the pig into four pieces. Chop away uneven parts of each slab. Step 3: Separate the fat layer beneath the skin. 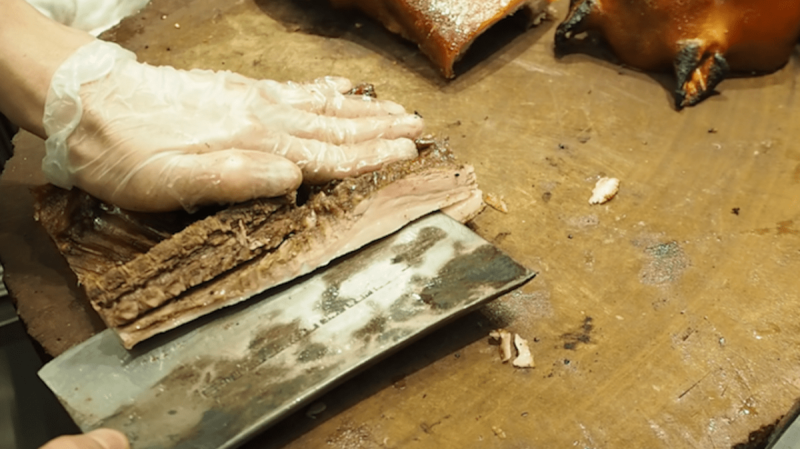 Look out for the unctuous layer that lies in between the skin and the meat. One end of this part of the fat usually merges with the bone so one can align the chopper to this boundary and slice it sideways. Discard this fatty layer. Also, slice and discard the fats from the underside of the skin. Chop away the uneven sides of the crackling slab to form a rectangle. Step 4: Chop the remaining parts of the meat with bones to about 3cm pieces. Repeat the same for the crackling. Step 5: To plate, assemble the chopped pieces of meat in neat rows on the platter. Cover the meat with chopped pieces of crackling. Step 6: Cut away the protruding cheeks and neck at the both sides of the pig’s head so that it can be balanced properly on the platter. Place the head in front of the rows of chopped meat and crackling. Slice hind legs sideways and arrange them at the four sides of dish. Serve. Don’t waste food by binning them. From brewing stock from leftovers to making pineapple jam from tarts, here are five nifty ways to save those festive goodies.